Rock Creek Reservoir in March. My wife Marsha and I decided to go fly fishing with other Northwest Flyfishers on the annual trip to Rock Creek Reservoir. 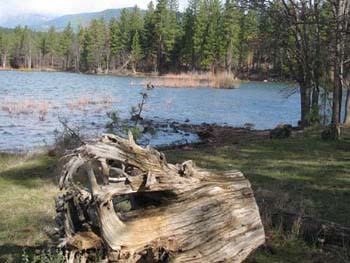 Rock Creek is a 15 acre lake in the Mt. Hood National Forest and has an average depth of 8 feet. 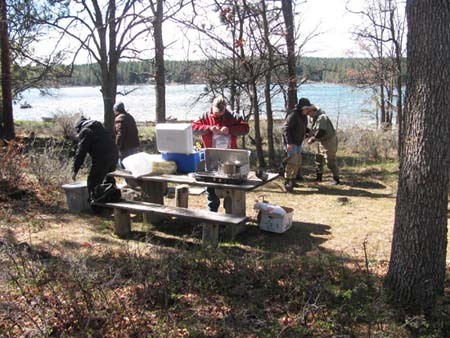 It has stocked rainbows, bass, bluegill and some large brood trout. 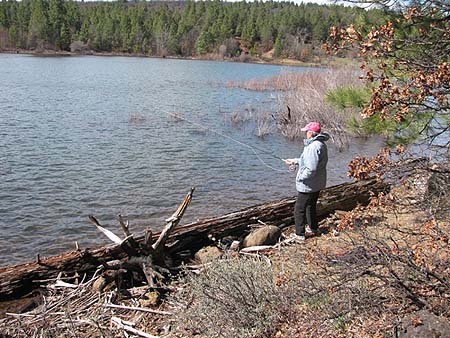 The lake is surrounded by pine trees and a good hiking trail around the shoreline that is relatively free of brush. We rigged up our outfits and tied on black and olive woolly buggers that we hoped would fool some fish. Both wet and dry lines are productive. Line selection will depend on the water conditions and the surface or underwater activity. The wind was blowing directly into our faces at 12 to 15 miles per hour which made casting difficult. In order to shoot the line out, we had to wait for the lulls, make quick casts and keep the line at a low angle as we stripped the line back. After an hour of fruitless effort, we took a break to see if anyone in our group had any success. 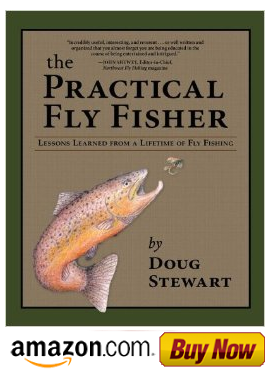 Some anglers had a few takes, but Stan was the lucky fly fisher. He had lost one, hooked a few and caught one whopper trout which was close to twenty inches. Most of the club members fished from boats or flotation devices. We decided to fish from the bank which was very accessible. 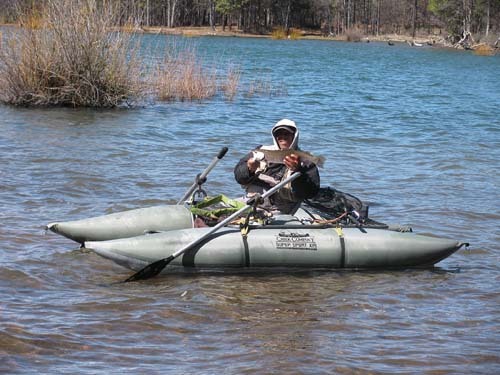 Marsha hadn't fly fished for years; however, fly fishing is like riding a bicycle--once you learn how, you never forget! Her favorite cast was the roll cast because of the trees and brush. We didn't catch any fish but we enjoyed the fishing, hiking, camaraderie and lunch put on by the club cooks, Dan and Zach, and Judy’s awesome brownies.